We returned to the Grays Harbor County Courthouse in Montesano on a Monday before Thanksgiving in order to turn in our passport applications. We had tried to apply for passports the year before at the Bellevue Main Post Office, but the line ran out the door. At this courthouse we strode right up to the county clerk's desk (room 203) without any waiting. It was such a pleasure. The other reason I planned this visit was to take a look inside of the building. My younger son and I had driven by on a weekend visit to Lake Sylvia State Park, when the building was closed. I had read that there were murals inside. Indeed, the interior of the courthouse is very lovely. The major murals are found inside the front entrance: a scene of Captain Gray landing to meet a party of Indians on Grays Harbor and a Governor signing a treaty at Cosmpolis with another group of Indians. The core of the building is taken up by three rising tiers of wide stairwells. The interior is richly decorated in marble, mosaic tile, brass light fixtures, and fine woodwork. 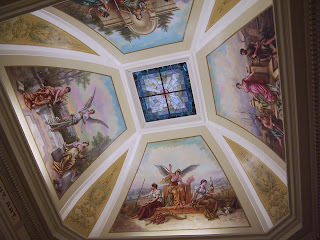 From the second and third levels you can view the ceiling frescoes inside the dome with allegorical female figures of justice, prosperity, and others. I asked the clerk whether tours are ever given of the building, but she didn't know of any. Still, you are free to wander about during public hours. She recommended attending a trial - always open to the public - because the courtrooms are also beautifully decorated. We agreed recently to help out the owner of the Ocean Cliff vacation rental house in Moclips with marketing. In exchange for taking new pictures of the house, putting up a new website, and promoting it on Craigslist.org and elsewhere, we were allowed to stay in the house for free one weekend and we'll get a 10% booking fee for any reservations we generate. The owner lacks the time to market the house on his own very effectively. I'm teaching my teenage sons how to build the website and post ads on Craigslist. If this first relationship goes well, we may offer it more widely as a little family business. We'll offer the service to homes in Washington, Oregon, Idaho, and British Columbia that we could reach in an extended weekend. The Ocean Cliff house in Moclips sits on a magnificent two acre site. 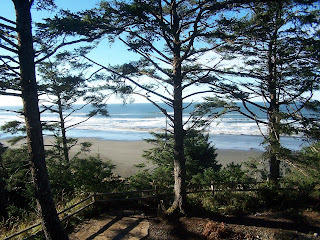 Through a few windswept trees at the cliff's edge, you have an unobstructed view of the Pacific Ocean and the wide sands of Sunset Beach below. The owners have landscaped the backyard beautifully with a cliffside deck and benches and a masonry fire pit. The fire pit becomes the communal focus of the house as we gathered there each evening. The house has five bedrooms: 3 up and 2 down. The two floors can be rented separately or else the whole house together. Each floor provides 1,300 square feet of space to spread out in. The highlights of the interior are the two king size beds in each master, the luxurious tiled bathrooms, the modern full kitchens, and the marvellous ocean view from nearly every room. Beach access is found by a short walk nearby: either down the stairs at the Ocean Crest Resort to the north or the Analyde Gap Road to the south. You can also drive down this road and park or drive on the beach. I returned to Point Grenville on 11/23/2008, bringing my family along to see the place. I had visited alone the previous April. We arrived at low tide, which made for a different experience. An extensive field of low rocks and tidepools were revealed that were covered up on my last visit. We saw hundreds of starfish in every crevasse and clinging to the bottom of the rocks. This rock with the arch shown above was the limit of what you could see to the north at high tide. Now, we could walk out beyond it, skipping from rock to rock. Bob's Pacific Beach House has partnered with two other luxury beach houses around the Olympic peninsula: the Rialto Beach House in the northwest corner and Triton Cove Beach Home on Hood Canal. We offer a 10% discount when two or more homes are booked together. The idea is that these homes can be booked together as a package to cover all the sights of the peninsula and Olympic National Park. If any particular house is booked, we have a list of alternates and will help you plan your trip. Located directly on the water with a big deck and hot tub looming over the beach. State park's boat ramp located immediately adjacent to the property. Collect your dinner right off the beach at low tide or out of Hood Canal with a crab pot. Gorgeous log home located just three miles from famed Rialto Beach. The house sits on ten acres directly on the Quillayute River. The nearby Rich Wine Bar is a great spot for fishing and its unobstructed view of Mount Olympus. Gather in the evenings around the fire pit. Set on a bluff with wide view of the ocean. Half mile walk or drive to the beach. Driving, bike riding, and evening bonfires allowed on the beach. 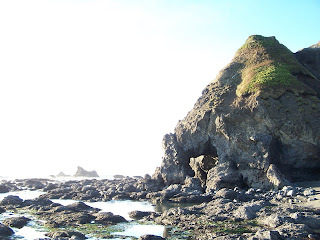 Seven miles to incredible volcanic reef and seastack rocks at Point Grenville. Half an hour to Lake Qunault.